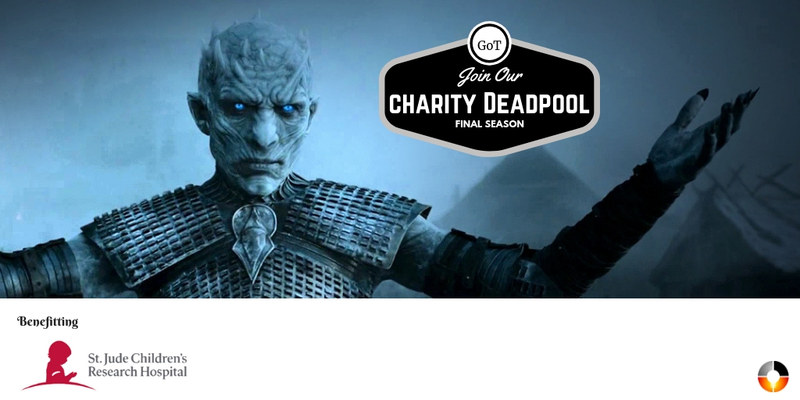 Welcome to our Game of Thrones Charity Deadpool. It’s like March Madness with comically gruesome death! All you have to do to play is to create an entry sheet below. We will contact you for your donation of $10 for each sheet with several payment options. 100% of that money (less any platform transaction fees) goes directly to St. Jude Children’s Research Hospital. If you are going to torment yourself with watching your favorite characters get killed off, please consider playing and doing it for a good cause. Predictions can be made until April 14th, 5pm central. If a character you pick in the season dies in any episode then you will receive 2 points. If a character you pick dies in the episode you specified for that character to die then you will receive 2 extra points. Each sheet gets eight character picks, create as many sheets as you like. You can’t change a sheet once it is created. Each sheet requires a $10 donation (you will be contacted once you complete one) and with that $10 you will receive weekly updates on your score and rank in the game. You can also follow along as we make our donation to St. Jude at the end of the season. Character deaths are assessed at the end of each episode. A character has died if they have been mortally wounded at the conclusion of the show. Character deaths will be announced after each show airs and points will be awarded at that time. If a character is resurrected, becomes a wight or somehow or another returns to the show having miraculously survived their impending doom there will be no change to the points awarded for the show in which they died. Time is limited, begin filling out your entry and play along with us. Once you have completed at least one entry you will be contacted at the email provided for your donation. Once your donation is collected you will begin receiving updates on your points and rank. Email address Each email can have up to 8 entries. Sorry, the time for submissions has passed.